Hello dear all, have you ever typed a zoo report with a cat sitting on your lap and licking your hands constantly. Well, that is what I am actually trying to do (no, not the licking, the typing !!). So, on August 14 at 6:00 a.m. after a “see you soon”-kiss to all my cats, I closed my front door and went my way to the Leuven station carrying a suitcase that was actually too heavy and too big for me. All the way I was wondering why on earth I took all these things with me and how – again on earth – I was going to manage to make the stairs. Na well, in some way or another, I made it (with the help of some elevators). In the afternoon of August 14, I arrived in Berlin-Zoologischer Garten, rushed to my hotel for the check-in and to leave my luggage in my room, to grab the camera’s and then – off to the zoo. First one to pay a visit is – of course – Knut. I blow over all kisses from anyone who asked me, even picked up the bags at the stations where my train made a stop. And even if people would now immediately declare me insane, I do not care. Knut was resting a while and so I went to say hello to the other buddies. 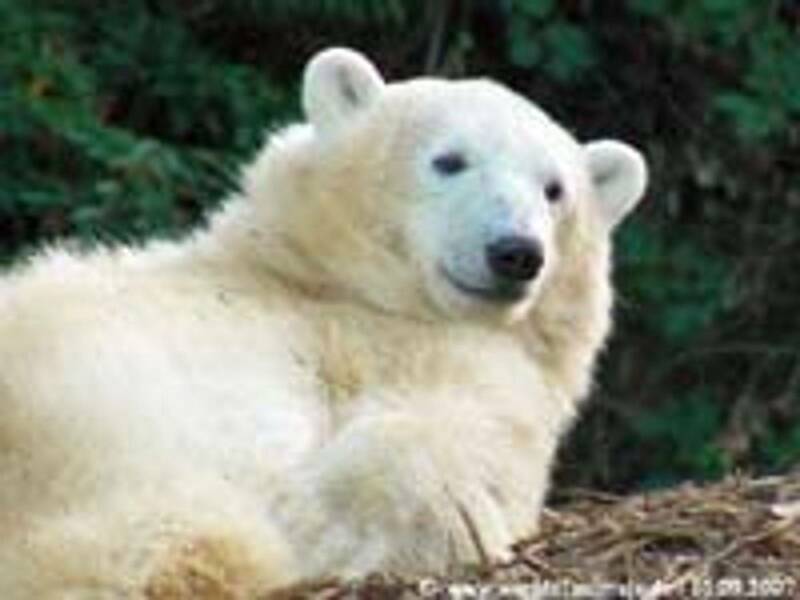 Brown bears, polar wolves, polar bears, coati’s, who all showed different ways to relax and enjoy the day. Since it was quite sunny, there were a lot of people in the zoo, which made it not so easy to see a lot. This made me start a little prayer for rain for the other days, since I am definitely not tall. And of course, I wanted to see Krümmel and Felix again. They were climbing on my fingers and gave me gentle nibbles (yes yes, even Felix did not bite hard, he kept that surprise for the next day, the rascal). Back to Knuti, where I met Frühlingsstern. The day before she posted a little message that she was hoping to see me soon again in Berlin. Can you imagine her face when she was seeing me there? But as I told her, one can only obey such request. And so, we chatted and, of course, kept our eyes on Knuti. When we heard the opening of his beloved door, we could not believe our eyes. He came up sooo slowly like an old man and walked as if he had to carry the earth on his back, looked at each other and asked ourselves: “what is this?”. Then, people told us that he was not feeling so well, having crumps and diarrhoea and the like. Nah, well, this did not make us so happy. Then, we went to the cats house and enjoyed the leopards and jaguar kids (the other days, I could see nothing anymore because the insight was blocked for visitors to give the little black one the time to rest) and the Sandkatze. Then, arranged to see each other again the next day and I went back to the hotel. I was pretty hungry and needed meat. On Friday, August 15, I was the first to take breakfast (at about 7:30 a.m.). Funny thing, I took place in a corner, and after a while three other visitors arrived and made me notice that we all took a corner from which we could control each other (after all, we humans, we are predators and tend to defend our “territory”). And then – again off to the zoo. Héhéhé, I was the first to enter and – of course – straight to Knut. In all honesty, I must confess that I was a bit worried about him. But, Joepppiiiee, when I arrived at his enclosure, he was very lively. He was already in the water playing with a ball. Believe me, the first hour in the zoo is always adorable, almost no people and the ones who are there are silent and respectful for this environment. So, we were standing at Knuti’s enclosure with “5 man en een paardenkop” – as we say in Dutch – freely translated = 5 men and a horse head. Which also means that one can freely walk around to take pictures without embarrassing others. At a certain moment, a lady came and said “hé, there you are again”. It was Mamma Frühlingsstern and it gave me the feeling of being one of the “anciens”, even though it was only my fourth visit. But that too is part of the magic, you meet people there and it brings so much joy. It was such a pleasure to see Knut playing. He was showing us all his toys, jumped in the water, dived for these toys, played with them, throw them away again and again. During my previous visits, I never saw him so active. Mostly, in the morning he was asleep. But not this time !!! Then, at a certain moment, Mr. Henkel popped up to check whether everything was fine with Knut. Needless to say that when he saw him playing and running around, he was released. You all will most probably remember Christina’s stories of the gardener. Well, at a certain moment, there were people of the zoo cutting the trees in front of Knut’s enclosure. And believe me, he kept an eye on them and was controlling whatever they did. It was also very funny that he tried to touch them with his paws and to see his head following their movements. Then, I realized that there are other animals too and went to the big polar ones for their feeding. Well, this feeding was done by a young man (and even though other people made remarks, he did not do it so badly, he simply did his best). And of course, Lars is in fact a lazy potato, he only wants the keepers to throw the meat right in his mouth (an easy way to feed this polar bear and success guaranteed). Actually, I have more respect for the females, who – at least – make an effort to jump and dive for their food. Then, it was time for some coffee. After that I made a tour and I wanted to see the otters. And yes, this time I was lucky, I saw them and the small ones too. Well, frankly, I did not see that much, but I hope my camera lens has seen more (still have to wait for the pictures – I hope to have them this coming Friday – so cross your fingers too). After a while, I was hungry and needed – yes – meat. Actually, I was running around from one enclosure to the other, to see as much as possible. Then the time came for Knuti’s feeding, done by Mr. Henkel. I think that Knut was still a bit on a diet, because he did not get that much ( a fish, a piece of meat, some bananas, a few potatoes, carrots and some rolls). My God, you should have seen his face when he realized that the feeding was over. If this bear was then able to talk, you most probably could have heard him saying: Hé, uncle Ronny, come back, I still need to fill up some holes in my belly. Thereafter, I went to the sea lions because I wanted to see Völker. Well, this is really recommendable. This is not only a show but also a token of the relationship that can exist and be created between animals and human beings. And yes, Völker is a sweetie. After that, Frühlingsstern and I went back to Knut where we saw him producing a big – well, a big one. Looking at each other and Knut, we were wondering when he ever was having the spaghetti. Well, later on, we knew, he never had spaghetti. Again running from spot to spot, most often Knut’s place because I was hoping to meet at least two persons there, went to the zebras, ape house, Ine and Kito and so forth and back to Knut. But unfortunately, it never worked. By that time, it was seriously raining and I was soaked and tired. So with a certain sadness in my soul because I did not find the ones I was hoping to find (all the days before I was dreaming about all stories we could have told), I left this lovely place and went back to the hotel. On Saturday, August 16, same morning scenario. Arriving at the zoo, I saw two persons who are very precious to me (because they learned me all I know about this zoo). First of all, a quick look at Knut, who was – surprisingly – asleep. We went then to the Nocturnal Animal House and were lucky that the lights were still on (but only for a very short time, but at least I could see something). Then back to Knut, who was awake again and finally successful to completely demolish the fender (and believe me, he was proud of himself). And then, we retrieved this “spaghetti” in his moat. Well, to keep it very brief, I do not think that I will eat spaghetti for the next 10 years (YIKES !!!). But Knut saw it somehow different, he realized that in fact he was already very hungry and wanted to have food. So, he started to run up and down and was waiting for his keepers to bring him something (way too early of course). By then it was time to go to Adolpho’s place with the hope to see him (when I came to Berlin, I made a list of all the animals I wanted to see and of course, he was one of my aims). So, we were sitting there and waiting. All of a sudden a keeper and some people entered his “private residence”. I was asking my friends whether they think it would be allowed to join them and they said, well try it, why not. Well, well, what shall I say. I followed these people and their first reaction was “GET OUT”. Then I stumbled and prayed to allow me to make – pleeaaase - at least one picture of Adolpho and luckily for me, his keeper agreed. So, in less than no time I made three pics and thanked him for this. Outside, we waited for about one hour and, JUCHUUUU, his keeper and Adolpho came out. It goes without saying that my camera was very busy. We were even permitted to touch him. Ah, how shall I describe this? His fur is very raw and hard but his nose is sooooo soft. We all followed the keeper and the sweetie to the meadow and when Adolpho was put on the ground, he ran to us and I could touch him. After a short while, he was sitting on my lap and I could hold him in my arms and give him kissies. I hereby will refrain to tell the story about the stupid people who made a fuss about Adolpho making a hole in the woman’s pants. It was so ridiculous (for not saying that the man was rather aggressive). If you know something about animals and if you do not want to have whatever damage, well then, do not call them to come closer. After that, we went back to Knut (almost feeding time). He got more than the day before and clearly enjoyed his food. But alas, according to Knut, it was again not sufficient. After my friends left, I re-started my wandering tour till it was time to go back to the hotel. On Sunday, August 17, I knew that there were only a few hours left for me to spend in this beautiful zoo. So, back to Knut who was again extremely active and playing with all the toys he could find. While diving, he made big splashes and it was such a pleasure to watch him. Most probably, most people would now say “well, you have seen it by now”. But like we all know, you never get enough of it and it is certainly never boring. When the time came that I had to go back to the station to get my train, my heart was heavy. And no, I was not lucky, I did not retrieve Frau Renate (and by God, I was hoping this so much, because she has been so friendly). But on my way back home, I knew that I will come back to Berlin. This young bear is so gorgeous and even if Knut would ever leave Berlin, this zoo is always worth a visit. And as long as I can reach him without having to take the plane, I will do my best to meet him again. Can somebody explain to me why all of a sudden such love and peace (and hope and acceptance) was born in my heart? Except for my youngest sister (who is worth more than my own life) and my cats (which I definitely do adore), I seldom found a reason to love, to hope and to accept something in my life.